For studies using anesthesia, the SA-TCS-6: Complete Small Animal Heater Controller with a 6” x 8”heated bed can be used to maintain the animal temperature. IX-BIO4-SA: a 4 channel ECG/EMG recorder. IX-ECG12-SM: a 12-lead ECG recorder. 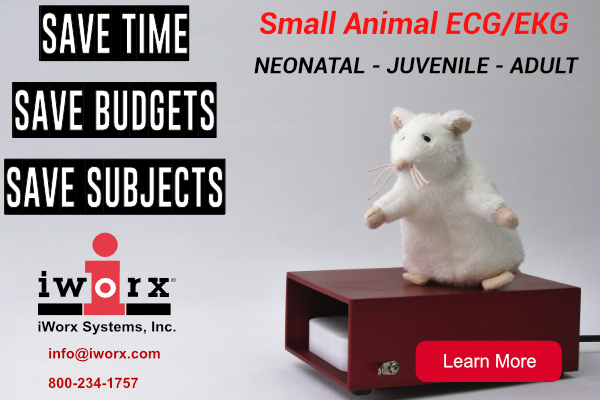 iWorx systems, recorders and software have been used for recording ERGs in rodents and insects as noted in these Citations. The iWorx RA-834 Recorder is the most advanced and feature-rich physiological data acquisition system on the market. Samuels, Ivy S., et al. “Exclusion of Aldose Reductase as a mediator of ERG deficits in a mouse model of diabetic eye disease.” Visual neuroscience 29.06 (2012): 267-274. Wu, Jiang, et al. “Contribution of Kir4. 1 to the mouse electroretinogram.” Molecular vision 10 (2004): 650. Wu, Jiang, et al. “Voltage-dependent calcium channel CaV1. 3 subunits regulate the light peak of the electroretinogram.” Journal of neurophysiology 97.5 (2007): 3731-3735. Wu, Jiang, Alan D. Marmorstein, and Neal S. Peachey. “Functional abnormalities in the retinal pigment epithelium of CFTR mutant mice.” Experimental eye research 83.2 (2006): 424-428. PEACHEY, NEAL S., J. BRETT STANTON, and ALAN D. MARMORSTEIN. “Noninvasive recording and response characteristics of the rat dc-electroretinogram.” Visual neuroscience 19.06 (2002): 693-701. Marmorstein, Alan D., Neal S. Peachey, and Karl G. Csaky. “In vivo gene transfer as a means to study the physiology and morphogenesis of the retinal pigment epithelium in the rat.” Methods 30.3 (2003): 277-285. Marmorstein, Alan D., et al. “A model of best vitelliform macular dystrophy in rats.” Investigative ophthalmology & visual science 45.10 (2004): 3733-3739. Wu, Jiang, Neal S. Peachey, and Alan D. Marmorstein. “Light-evoked responses of the mouse retinal pigment epithelium.” Journal of neurophysiology 91.3 (2004): 1134-1142. Wu, Jiang, et al. “Voltage-Dependent Calcium Channel Ca.” Hum. Mol. Genet (2010). Yu, Minzhong, et al. “Age-related changes in visual function in cystathionine-beta-synthase mutant mice, a model of hyperhomocysteinemia.” Experimental eye research 96.1 (2012): 124-131. Won, Jungyeon, et al. “Membrane frizzled-related protein is necessary for the normal development and maintenance of photoreceptor outer segments.” Visual neuroscience 25.04 (2008): 563-574. Shen, Yi, Wan-Yu Zhang, and George CY Chiou. “Effect of naringenin on NaIO3-induced retinal pigment epithelium degeneration and laser-induced choroidal neovascularization in rats.” International journal of ophthalmology 3.1 (2010): 5. Jiang, Wei, and G. C. Chiou. “Effects of hydralazine on NaIO3-induced rat retinal pigment epithelium degeneration.” Int J Ophthalmol 8 (2008): 1504-10. Shen, Yi, Pei Zhuang, and George CY Chiou. “Effect of Guanabenz on Rat AMD Models and Rabbit Choroidal Blood Flow.” The open ophthalmology journal 5 (2011): 27. Zhuang, Pei, Yi Shen, and George CY Chiou. “Effects of flavone on the oxidation-induced injury of retinal pigment epithelium cells.” International journal of ophthalmology 3.2 (2010): 99. Samuels, Ivy S., et al. “Light-evoked responses of the retinal pigment epithelium: changes accompanying photoreceptor loss in the mouse.” Journal of neurophysiology 104.1 (2010): 391-402. Shen, Yi, et al. “Effect of Tetramethylpyrazine on RPE degeneration, choroidal blood flow and oxidative stress of RPE cells.” International journal of ophthalmology 3.3 (2010): 205. Dalziel, J. E., K. E. Dunstan, and S. C. Finch. “Combined effects of fungal alkaloids on intestinal motility in an in vitro rat model.” Journal of animal science 91.11 (2013): 5177-5182. Rajashekhar, Gangaraju, et al. “Regenerative therapeutic potential of adipose stromal cells in early stage diabetic retinopathy.” PloS one 9.1 (2014): e84671. Chabot, Christopher C., and Laura K. Webb. “Circadian rhythms of heart rate in freely moving and restrained American lobsters, Homarus americanus.” Marine and Freshwater Behaviour and Physiology 41.1 (2008): 29-41.
iWorx provide a manual Rodent NIBP system. This is a low cost alternative, for student research or for low throughput studies. 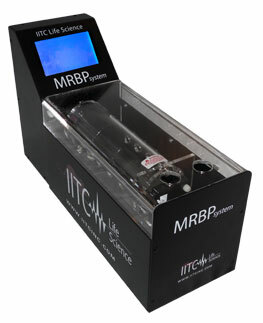 The manual Rodent Non-Invasive Blood Pressure System, uses the tail cuff method to measure Blood pressure in rodents. These systems are suitable for recording and measuring Respiratory Quotient, VO2 and VCO2 in small- to medium-size animals. The systems include the IX-Peak recorder and Gas Analyzer, LabScribe software with the Metabolic Calculations Module and either a 1.4 L or 5.2 L animal chamber. Moyano-Porcile, Valentina et al, Short-term effects of Poly(I:C) on gut permeability, Pharmacological Research, Available online 2 July 2015, ISSN 1043-6618, http://dx.doi.org/10.1016/j.phrs.2015.06.016. Moyano-Porcile, Valentina, et al, “Short-term effects of Poly (I: C) on gut permeability,” Pharmacological Research (2015). Marmorstein, Alan D et al, “Bestrophin-1 influences transepithelial electrical properties and Ca2+ signaling in human retinal pigment epithelium.” Molecular vision 21 (2015): 347. Peña, James R. et al. “Localized delivery of mechano-growth factor E-domain peptide via polymeric microstructures improves cardiac function following myocardial infarction.” Biomaterials 46 (2015): 26-34. Dalziel, J. E., V. Mohan, J. Peters, R. C. Anderson, P. K. Gopal, and N. C. Roy. “The probiotic Escherichia coli Nissle 1917 inhibits propagating colonic contractions in the rat isolated large intestine.” Food & function 6, no. 1 (2015):256-263. Ling, István, Balázs Mihalik, Lori-An Etherington, Gábor Kapus, Adrienn Pálvölgyi, Gábor Gigler, Szabolcs Kertész et al. “A novel GABA A alpha 5 receptor inhibitor with therapeutic potential.” European journal of pharmacology 764 (2015): 497-507. Schwebe, Matthias, Sabine Ameling, Elke Hammer, Judith V. Monzel, Karina Bonitz, Susanne Budde, Kathleen Schult et al. “Protective effects of endothelin receptor A and B inhibitors against doxorubicin-induced cardiomyopathy.” Biochemical pharmacology 94, no. 2 (2015): 109-129. Allwood, Melissa A., Andrew J. Foster, Alicia M. Arkell, Marie-Soleil Beaudoin, Laelie A. Snook, Nadya Romanova, Coral L. Murrant, Graham P. Holloway, David C. Wright, and Jeremy A. Simpson. “Respiratory muscle weakness in the Zucker diabetic fatty rat.” American Journal of Physiology-Regulatory, Integrative and Comparative Physiology (2015): ajpregu-00447.